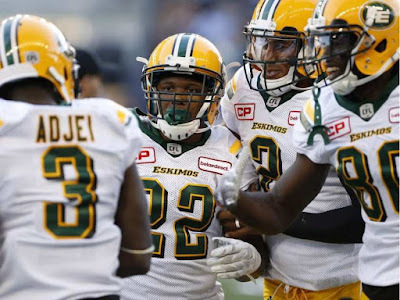 WINNIPEG - Zach Kline connected with John Harris for a 22-yard touchdown and Marion Grice had a two-point convert as the Edmonton Eskimos salvaged a 38-38 road tie against the Winnipeg Blue Bombers on Thursday in CFL pre-season action. In Winnipeg's first pre-season game against the Saskatchewan Roughriders, the game ended in a 25-25 tie on June 10. No overtime is played in the CFL pre-season. Bombers backup quarterbacks Dominque Davis and Dan LeFevour both scored on second-half touchdown runs on Thursday to help the Bombers get the lead. Davis engineered a four-play, 102-yard drive, capping it off with a seven-yard TD run at 14:37 of the third quarter. The score gave Winnipeg its first lead of the game, a 24-17 edge in front of 24,934 fans at Investors Group Field. LeFevour started the fourth and got help from an Edmonton pass-interference call that moved the ball 38 yards to the Eskimos' three-yard line. LeFevour then ran the three yards for the major at 1:30 and 31-17 lead. Edmonton running back Marion Grice would make it 31-23 after a two-yard run and a missed convert by Sean Whyte, but Bombers running back Timothy Flanders busted loose for a 46-yard TD run at 9:48 for the 38-23 lead. Worse yet Eskimos sat out most of their starters. Only 2 starters on offence, both on OL. In 2nd half sat down those 2 as well & played 4 rookies on OL with backup Beard @ ctr. Also missing Willis, Hunt, Sewell, Sherritt, Ladler, Thompson, Hightower & Young on defence. Winnipeg played their 1st stringers entire half vs Eskimo 2nd stringers. See what happened when Ottawa left most of 1st team at home? Surprised Bombers couldn't do same to Eskimos. Should be able to beat them by a bunch. Up 38-23 with under 3 minutes & Grice, their 4th string QB comes back to salvage a tie. They even took out Williams, their best receiver in this game, after 1 Qtr. This was more like a loss for the Bombers. The Esks offense looks lethal even with the back ups in and i know its just preseason.I think Esks have 3 starters at Qb while the riders barely have 1. The bombers used starters for half the game and struggled against a Edmonton rookie line up...I would guess the bombers are going to struggle this season. The Bombers have questions, no doubt, after that showing. If you liked Franklin as a possibility before for the Riders, you got to love what you see now. Pretty good stats with no White or Van, no Bowman, Zylstra, Hazleton & their group of National receivers. They also took out their best pre-season receiver, that big kid Williams, after the 1st Qtr - probably because he's got a spot & they wanted to look at some other guys there. As for the Bombers, lots of dumb penalties extending drives in the 1st half on their #1 guys. Two weeks off now so will they be rusty for their 1st game in Mosaic? Riders can hope.